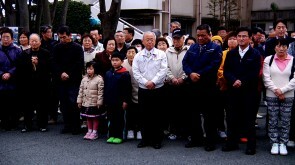 Documentary on the exile of inhabitants in the region of Futaba following the accident at the Fukushima Daiichi nuclear power plant on 11th March 2011. After the earthquake and the first explosion in a reactor, the Japanese authorities designated Futaba as an “exclusion zone” and moved 1,400 of the town’s inhabitants to a school 250 kilometres away. In the months that followed they lived there as refugees, not knowing how long they would stay or what future awaited them as they nurtured dreams of going home. A reflection on nuclear energy and its costs based on the Fukushima Daiichi disaster and its influence on the lives of a group of people.